Presentation is also significantly improved in Nanostray 2. The menus are simple to navigate and the weapons are easy to configure. There's speech before each stage as a robotic sounding female captain gives you your mission briefing which sets the scene perfectly. Should you fall foul of enemy fire, a grumpy voice will tell you to "Focus!" or perhaps say that you were "Too Close!". It's annoying, but it makes you determined not to mess up again so as not to give him another opportunity to berate you. Graphically, Nanostray 2 is of the same high standard as its predecessor. The enemy ships still look great and this time there's a little more variety. Expect to be fighting some slimy space monsters along with the usual generic space ships and fighters. Again, a great techno soundtrack fits in with the frantic and focused game play. You can expect a boss fight at the end of every level, and a 'mid boss' to appear at the halfway point during a level. 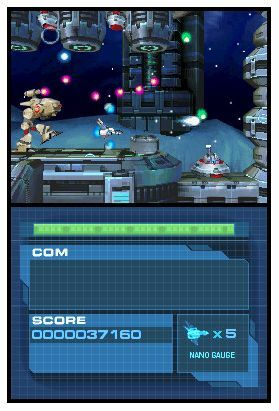 There's no easy ride fighting the bosses with your smart bombs this time, only skill and concentration will see you through. Providing the icing on the cake are the extra modes. Arcade mode lets you practise any stage you reached in story mode. Challenge mode is a new addition and is much more interesting. Here you must complete a series of challenges which range from dodging through a space station at very high speed to killing a certain number of aliens before time runs out. These challenges can prove very difficult but should you manage to beat enough of them you can unlock several mini-games (or simulators, as the game calls them). The challenges are also quite short and are ideal if you fancy a blast during a short journey. Finally, there's also a fun little two player mode (which requires only one copy of the game) and online leader boards, though unless you are an expert don't expect your scores to reach the tops of these tables. So, Nanostray 2 is obviously a big improvement on its predecessor, but like its predecessor it isn't terribly original. If you've played shooters before, you'll recognise the enemy designs and attack patterns. The slimy space monsters reminded me of Salamander or Gradius, the spaceships from any number of generic shooters. For a genre as old as this, it is often difficult to think of new ideas, but, Nanostray 2 doesn't even seem to be trying. Having said that, we need to remember that there aren't exactly a whole bunch of shooters on the DS, especially ones this good, and never forget the old adage, "if it aint broke, don't fix it." As a DS shooter, this is a real stand-out title and one you should definitely track down if you hanker after some proper old-school action. They don't make games like this anymore, well, not often enough anyway.